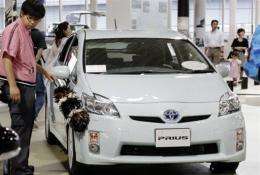 File photo shows a worker dusting a Toyota hybrid Prius at the company's showroom in Tokyo. Toyota Motor, reeling from a series of huge safety recalls, said Wednesday it had received dozens of complaints in the United States and Japan about brake problems with its top-selling Prius hybrid. Toyota Motor, reeling from a series of huge safety recalls, said Wednesday it had received dozens of complaints in North America and Japan about brake problems with its top-selling Prius hybrid. "As of the end of last year, we had dozens of complaints from dealers in Japan and North America," said Toyota spokeswoman Mieko Iwasaki. The automaker was investigating the reports, which involve the new Prius model rolled out last year, she added. Japan's transport ministry said it had received at least 13 complaints about Prius brakes in the two months to January alone. One driver complained that the brakes had failed, leading to a collision, a ministry official said. "Many complaints were submitted in a short period of time. We are investigating the cases to determine what measures the ministry should take," he said, without ruling out the possibility of a recall. Japanese media reports that the National Highway Traffic Safety Administration in the United States had received more than 100 complaints about the brakes of the new Prius. Toyota, which overtook General Motors in 2008 as the top-selling automaker, has been hit by a series of safety issues that have dented its coveted reputation as a producer of safe and reliable vehicles. The company is recalling almost eight million vehicles worldwide -- roughly equivalent to its entire 2009 global sales -- due to problems with accelerator pedals that could cause the car to speed up unintentionally.